I saw these cookies on Cooking Light in an article that was about how to pack cookies when you are sending them in the mail. I thought they sounded very interesting and I had some tahini in the fridge (leftover from making hummus), so I decided to try them out. I didn't like them very much when they were warm, although some people did, but once they had cooled and over the course of a few days, we all liked them alot. 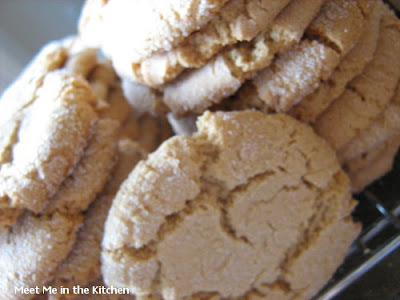 If you are looking for a different cookie with an interesting twist, these will do! Preheat oven to 375°.Lightly spoon flour into dry measuring cups; level with a knife. Combine flour, cornstarch, baking powder, baking soda, and salt, stirring with a whisk; set mixture aside.Place brown sugar, tahini, and oil in a large bowl; beat with a mixer at medium speed until well blended. Add syrup, vanilla, and egg; beat well. Gradually add flour mixture to sugar mixture, beating at low speed just until combined.Lightly coat hands with cooking spray. Shape dough into 36 balls (about 1 inch each). Place granulated sugar in a shallow bowl. Roll dough balls in granulated sugar; place 2 inches apart on baking sheets lined with parchment paper. Flatten balls slightly with the bottom of a glass. Bake at 375° for 10 minutes or until lightly browned. Cool on pans 2 minutes. Remove cookies from pans; cool completely on a wire rack.